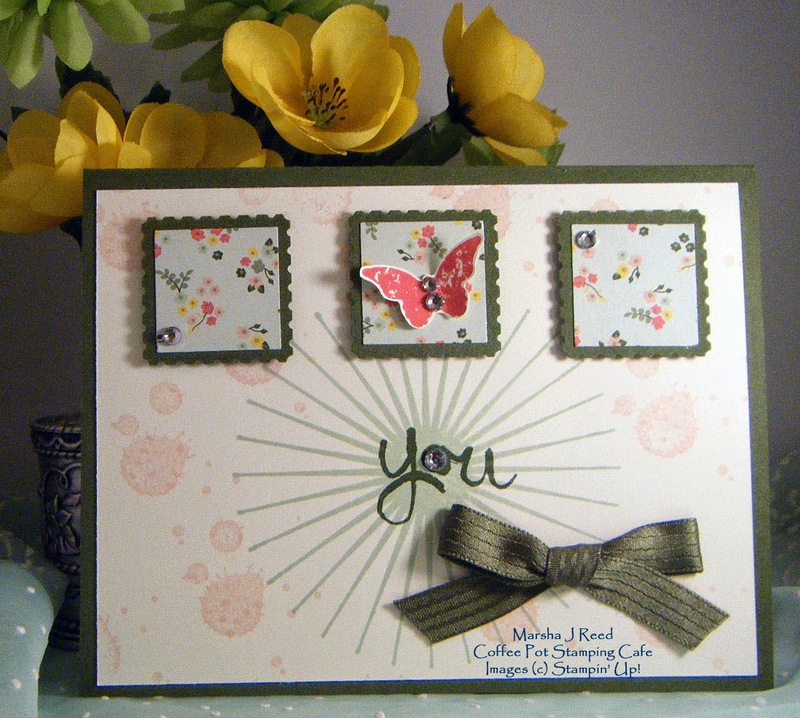 Just a short post today to share a card I made in May for a swap I've been participating in. I don't think I've shared it before. It was a fun one to design. 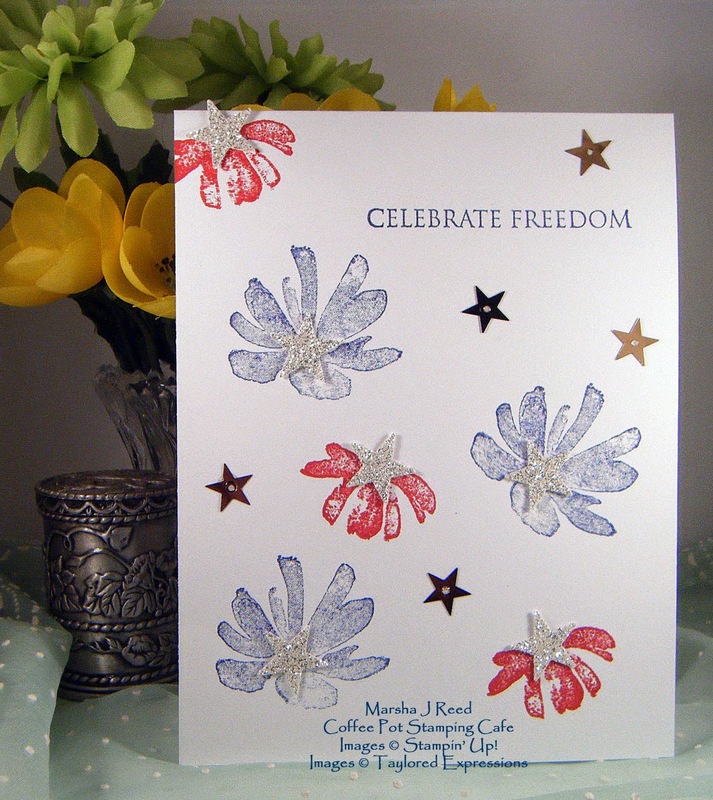 I love that Work of Art stamp set from Stampin' Up!® There is so much you can do with it. 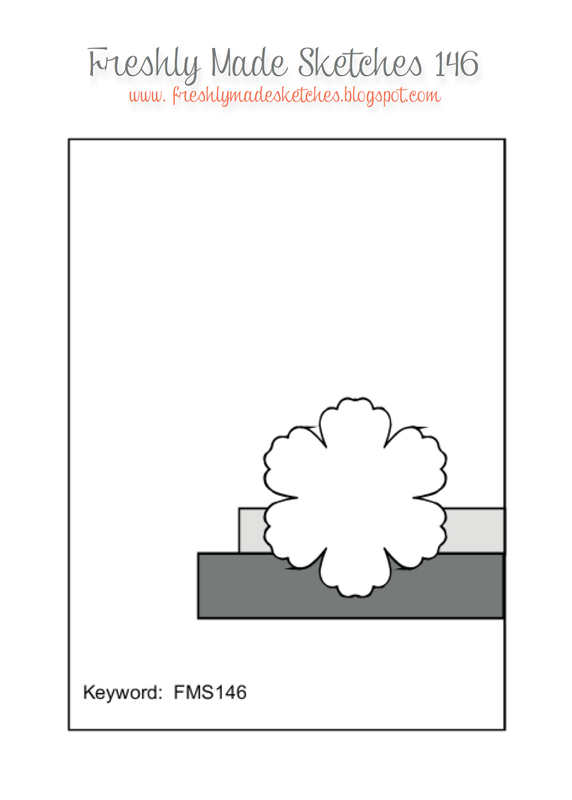 I've seen some flowers designed with it so that is something I want to try. It makes for a very interesting flower image. Catchy title, huh? Just kidding. 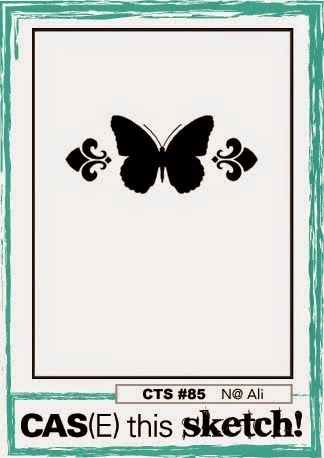 Actually, the thank you is from the Four You stamp set from Stampin' Up!® As much as I would like to attach a special name to each of my cards, I do run out of names. Then again, would you consider a name special no matter what it is? The other day I received a very cool card in the mail from Kim Glover. I've been participating in a swap with a group of Stampin' Up!® Demonstrators for that last few months and have gotten some very nice cards. I plan to CASE (Copy And Share Everything) several of them. I needed another thank you card and thought this would be a perfect one for a guy. I changed mine up just a wee bit and used different colors and I do like how this turned out. 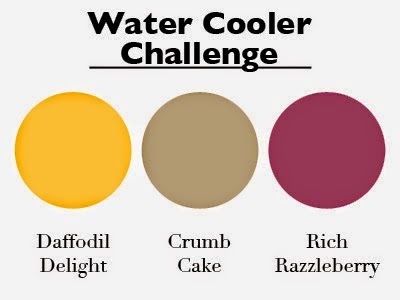 This week's challenge over at Watercooler Challenges is all about color; Crumb Cake, Daffodil Delight and Rich Razzleberry. I had one piece of Crumb Cake card stock left. Looks like that will be on the top of my list when I place my next order. You just can't be without Crumb Cake! These colors worked great together for a thank you card I need to give to a guy. 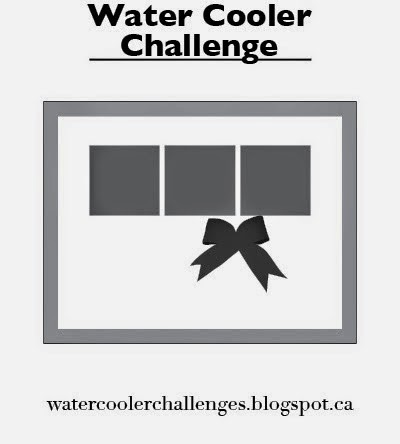 You can get the details and join the Watercooler Challenge HERE. Wow! Another week has come and gone and they just seem to keep getting busier and busier. I'm so glad I'm making a Christmas card a week so I can stay on top of that holiday project. This week's Christmas Card Challenge is 'anything goes.' For this one, I pulled out one of my favorite retired Stampin' Up!® stamp sets, Bells & Boughs, and did a little bit of paper piecing. 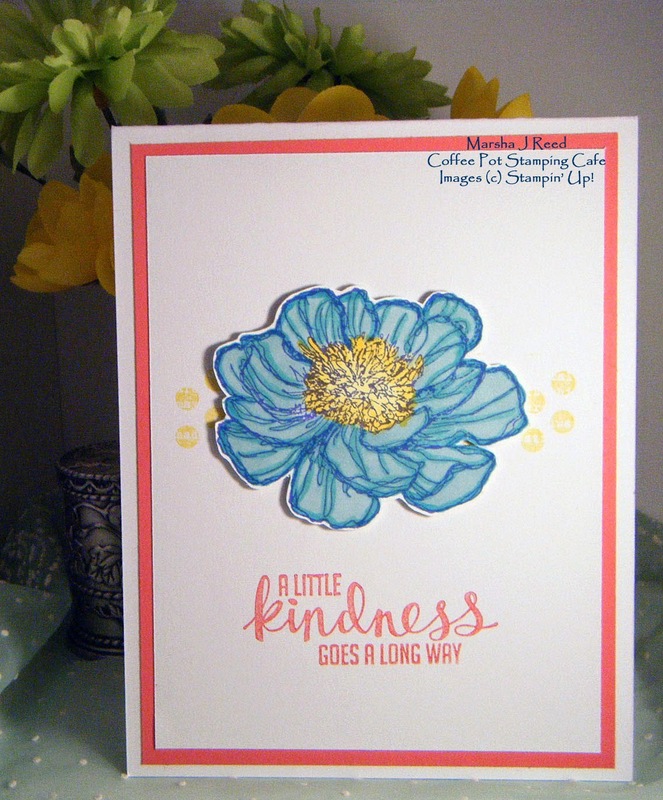 I stamped the first image on Whisper White using Mossy Meadow ink. 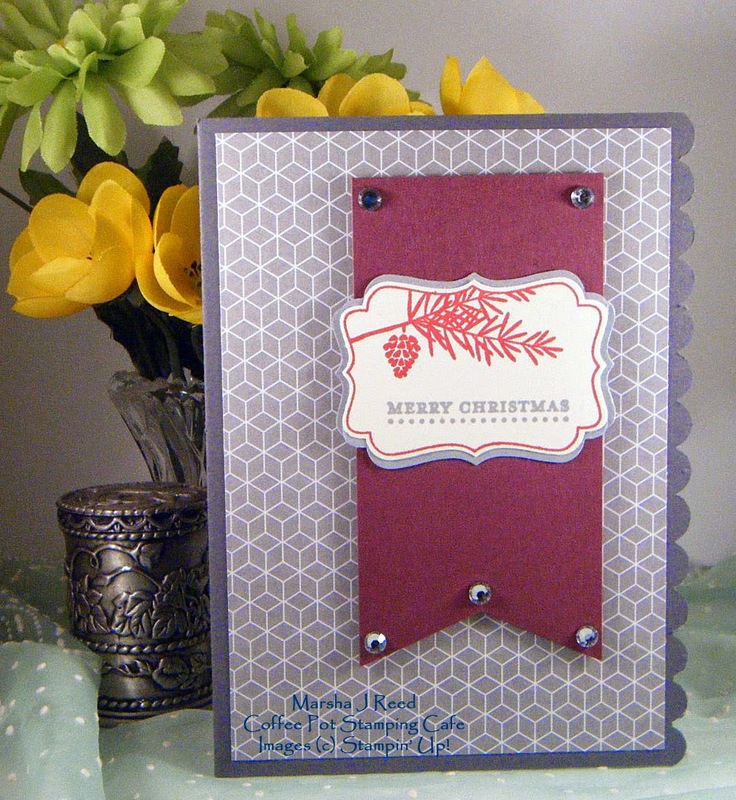 Then, I stamped the same image on Strawberry Slush card stock and cut around the poinsettias. Once cut I glued them to the image on the white card stock, added some embellishments (I love that Mossy Meadow Stitched Satin Ribbon) and this is the finished card. 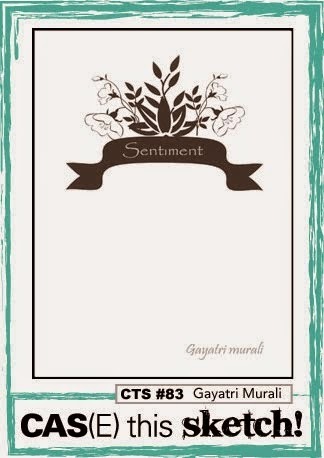 One of the things I did differently, is stamp a sentiment on the inside of the card. Usually, I simply hand write a note but this year, I'm changing things up a bit. Instead of writing a mini book in each card, I'm adding a sentiment along with a one sentence personal note. 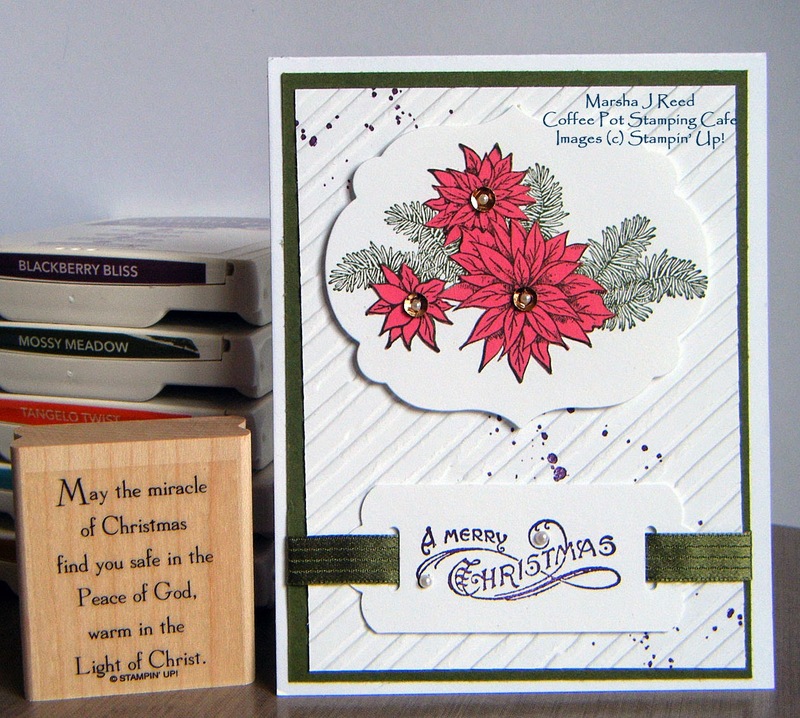 Click HERE to visit the Sunday Christmas Card Challenge blog and share your Christmas cards with us. We would love to see what you create. Okay, so I needed a thank you card. Would you believe I have a whole box of them made up and ready to go? And, yes, I had to make a new one! When I saw the sketch over at Pals Paper Arts, a design popped into my head almost instantly. I originally stamped the circle image on the card front but didn't like the flat look so I stamped them again and punched them out. Much better, don't you think? The little flowers are punched from the Moonlight Designer Series Paper Stack and matched my ink colors perfectly. I don't often add a sentiment to the inside of my cards as I hand write a note but I love this one from God's Blessings and it was so appropriate. Here is the card inspired by the sketch. With my ten year old granddaughter, Mariah, visiting for a few days, I've not had many chances to get into my craft studio. She does well entertaining herself but I love doing things with her when she is here. We spent yesterday afternoon putting together some past Paper Pumpkin kits and she had a ball. She is quite creative and has many very cool ideas. 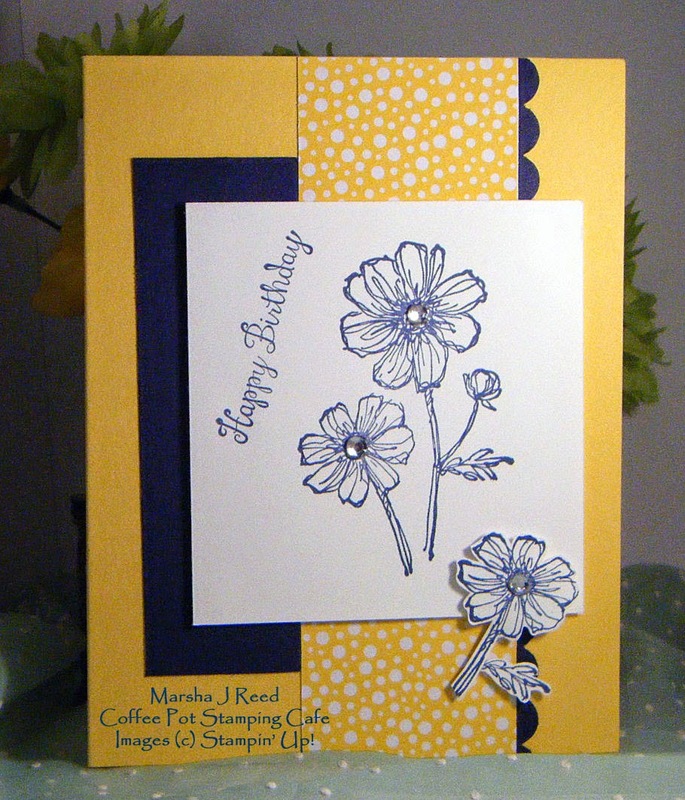 I did manage to sneak in a little solo creating last night and this is the card I made for Freshly Made Sketches. 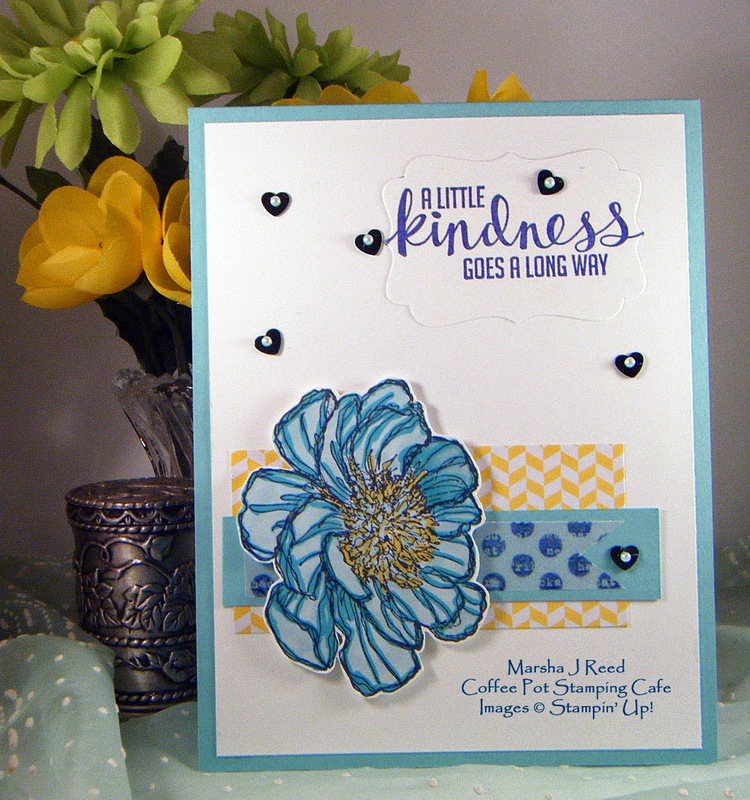 You can find the details for the Freshly Made Sketches challenge HERE. 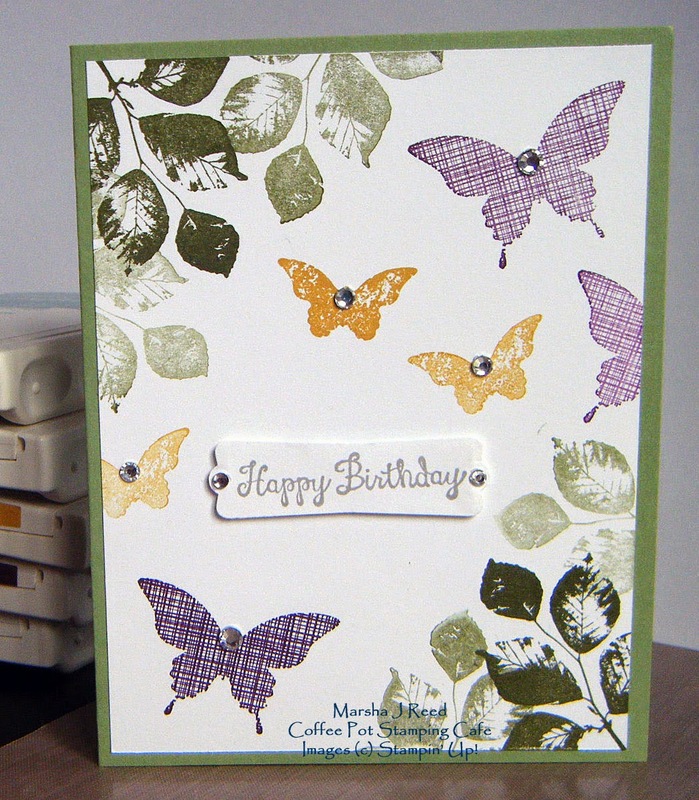 My friend and stamping buddy, Heather, has a birthday today. The card is on its way and should arrive just in time to let her know I'm thinking of her on her special day. It's been such a busy summer for her, that we've not had a lot of time to spend crafting together. 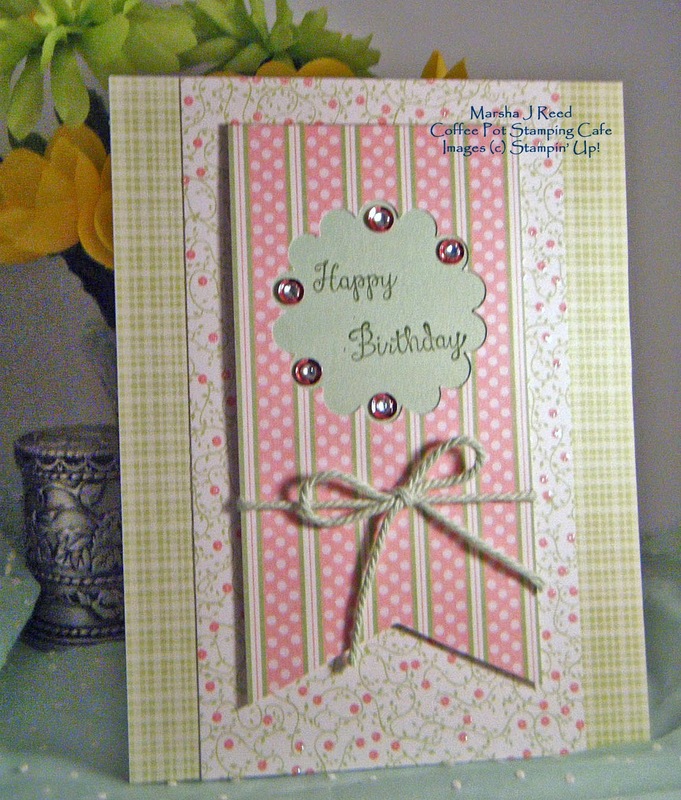 She loves pink, so I added as much pink as I could to her card but not so much it looked like Pepto-Bismol. :-) Because I love blues, I don't have a lot of pink paper on hand but I really like the way this came together. The sketch made all the difference. 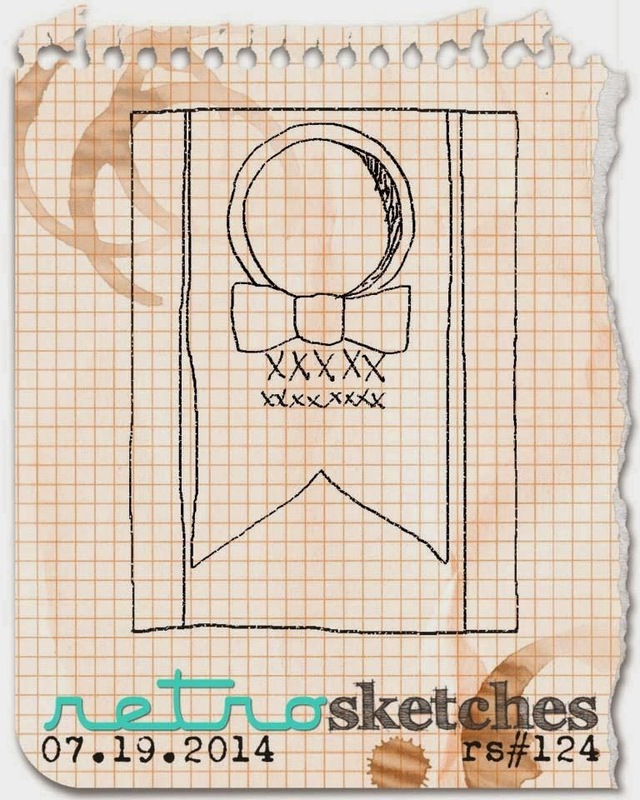 The sketch can be found, HERE, over at RetroSketches. My sister, Terri, loves purple. She lives in Wisconsin so we don't get to see each other often. We talk or text on the phone whenever we can. 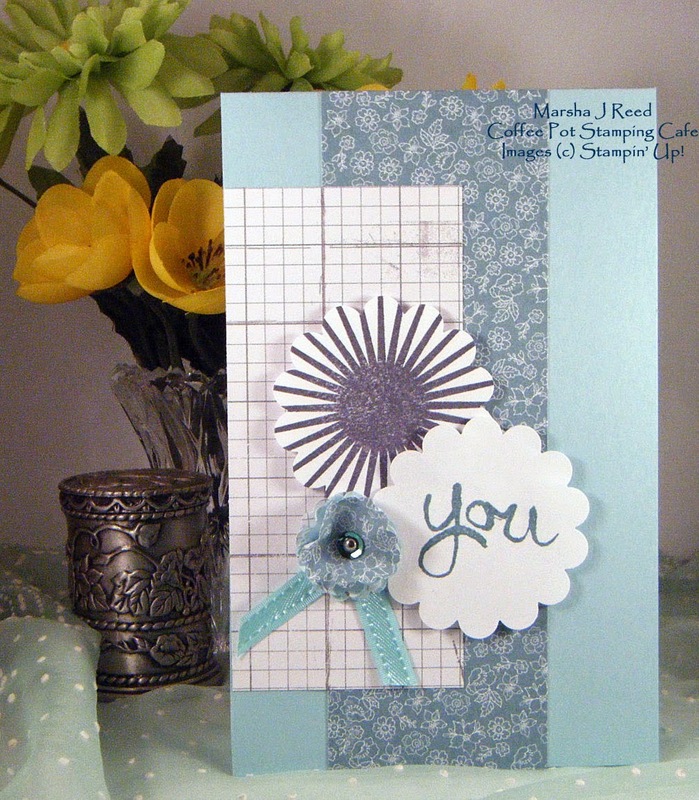 I was thinking of her today so made her this card using the color challenge I found at The Paper Players. It's monochromatic although it's hard to see the three different colors I used. The map is from the Map It Out photoplymer set from Stampin' Up!® and was stamped using Perfect Plum, the little hearts with Elegant Eggplant, the sentiment and borders with Wisteria Wonder. There is a very small border of gingham checked paper behind the white but it's hard to see as well. It matches the little heart I punched and added to the lower right. 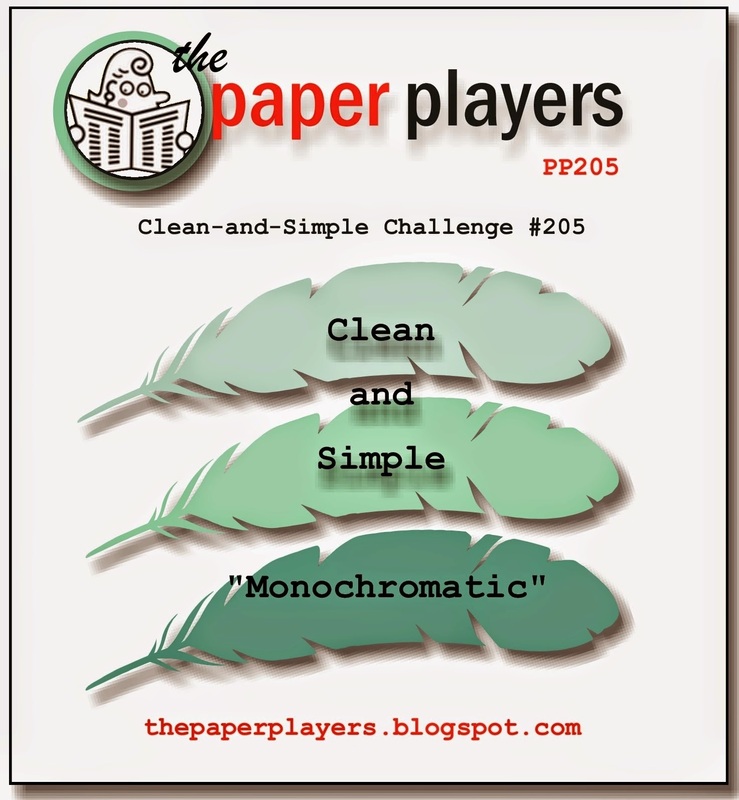 HERE is where you can find all the challenge details for The Paper Players Clean and Simple challenge with a Monochromatic theme. 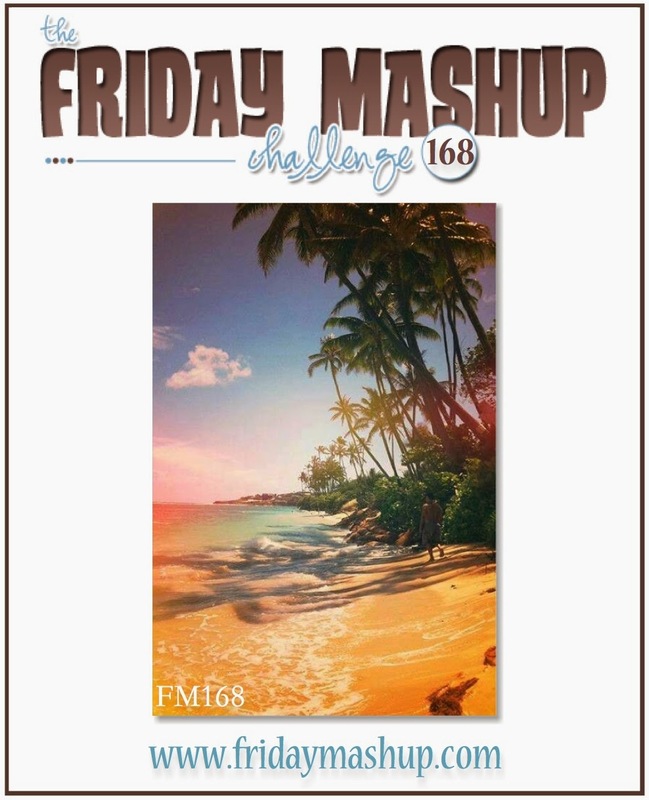 This week's Friday Mashup challenge is all about background or something 3-D or both. 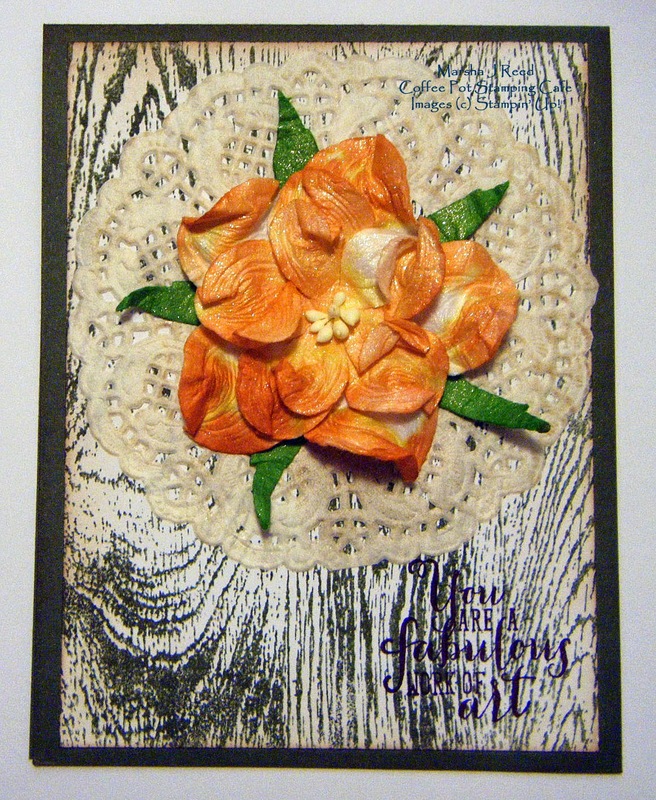 For my background I dug out one of my favorite Tim Holtz stamps and stamped a wood background to showcase my flower. To color the rose, I stamped the Tangelo Twist ink pad down on my craft mat, spritzed the ink with water then, laid the flower in the diluted ink. After drying the rose with my Heat Tool, I sprayed it with some Radiant Rain Shimmering Mist to give it a little sparkle. As you can tell, I still need to get a light of my photo tent. The picture is a little dark and does not show off the true color of the flower. It is much prettier in real life. Two challenges, one card. It's all good. I love combining a sketch challenge and a color challenge. For me, it's creating made easy. Fab Friday's color challenge uses colors I would not necessarily put together. 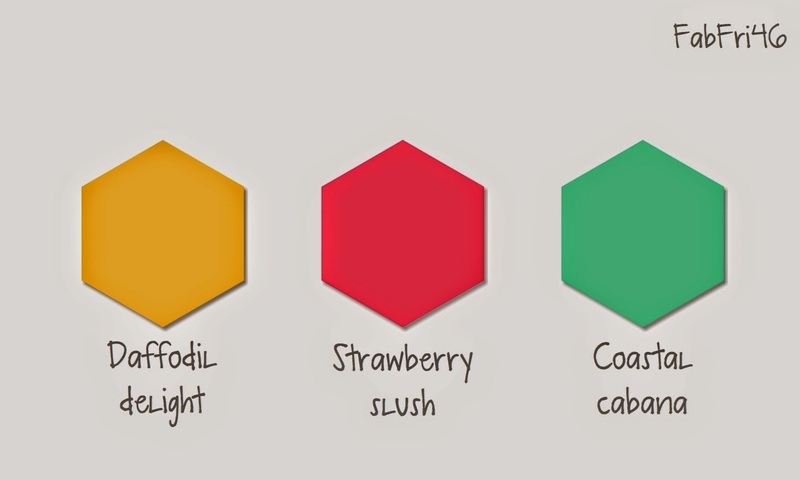 Coastal Cabana and Daffodil Delight, yes, but Strawberry Slush... now that one with the others I wasn't so sure about. Can I just say, I've changed my mind? I did stamp off the sentiment to give it a softer look. I was afraid the fully inked stamp would be too much. And, I loved the sketch from CAS(E) this Sketch. It was perfect for showcasing the flower. So, here is the finished project. 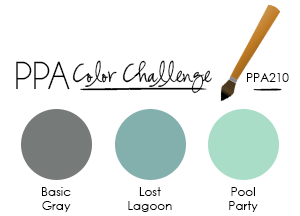 The Fab Friday color challenge can be found HERE. Hello and welcome to this week's Sunday Christmas Card Challenge. It's all about cookies. And, yes, this is my version of a cookie. :-) It was made using a mixture of Sparkle Mod Podge and Cherry Cobbler Re-inker for the frosting. 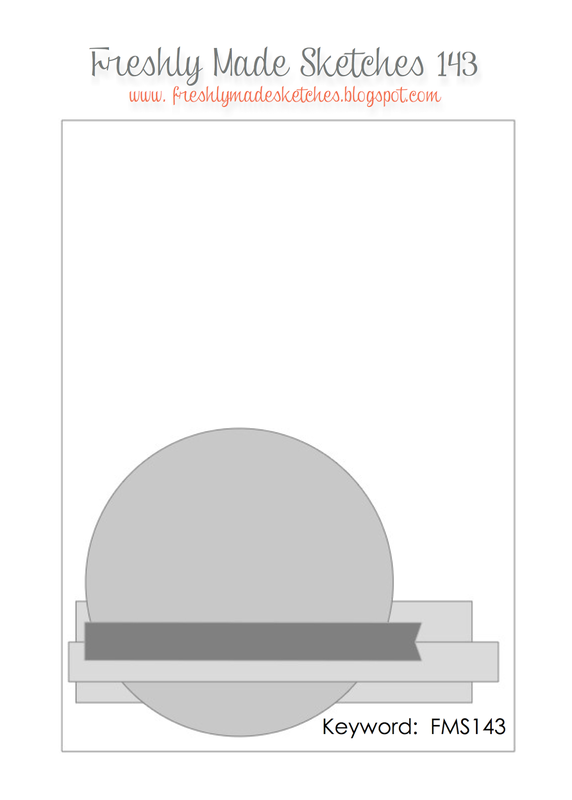 Then, accenting each scallop with a White Enamel dot. I wasn't sure what to put in the center of my cookie but I rather like the little Christmas tree. To join our challenge and get all the details, please visit Sunday Christmas Card Challenges HERE. If you've never tried Paper Pumpkin, now is a great time to sign up! You'll get 50% off your first two months. Between July 16, 2014--September 10, 2014 you can get 50% off your first two months of Paper Pumpkin. After that, keep the creativity coming for only $19.95 + tax per month (shipping included). It is available for month-to-month subscriptions, not prepaid subscriptions. This discount will be applied to one kit per month for the first two months of a new subscription. After the first two months, the price for each month's kit will go to the regular price: $19.95. You can sign up by clicking the following: My Paper Pumpkin. Be sure to enter the Promo Code, HALFOFF2 when you sign up. You have until Wednesday, September 10, 2014; 11:50 PM (MT) to join. Today would be a rather cool day to go sailing unless you wore your parka! Yes, the weather is that cool here in Iowa. It's cloudy, breezy and only 67 degrees. We are usually in the high 80s at this time of the year. I guess I can blame it on the Polar Vortex, right? 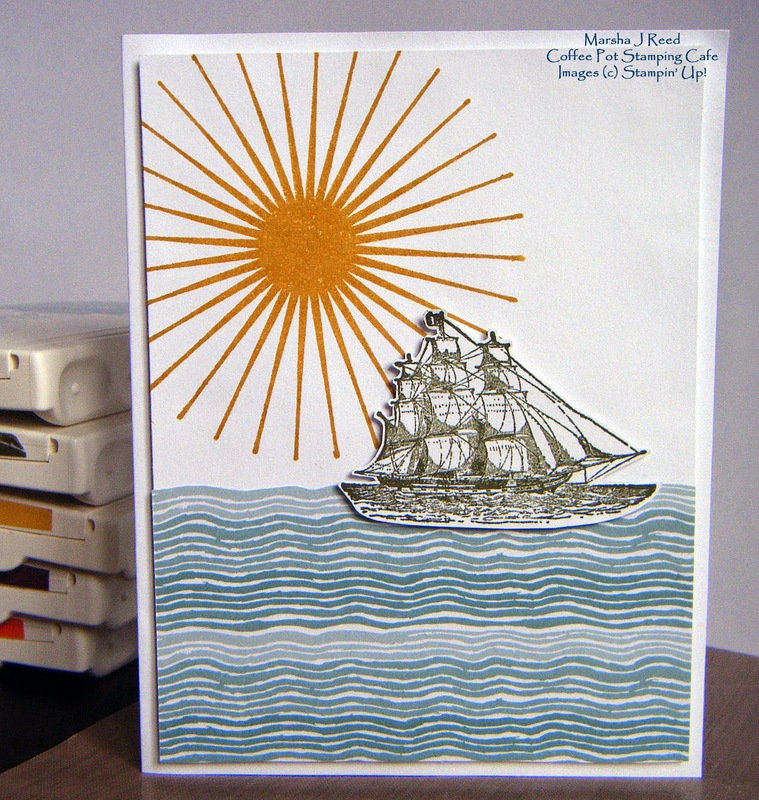 At least the card I made for the Friday Mashup Challenge "summer" theme let me enjoy sailing in the comfort of my craft studio. What doesn't show up well in the photo, is the sparkly from the shimmer mist. It looks like sun crystals when the light hits it. 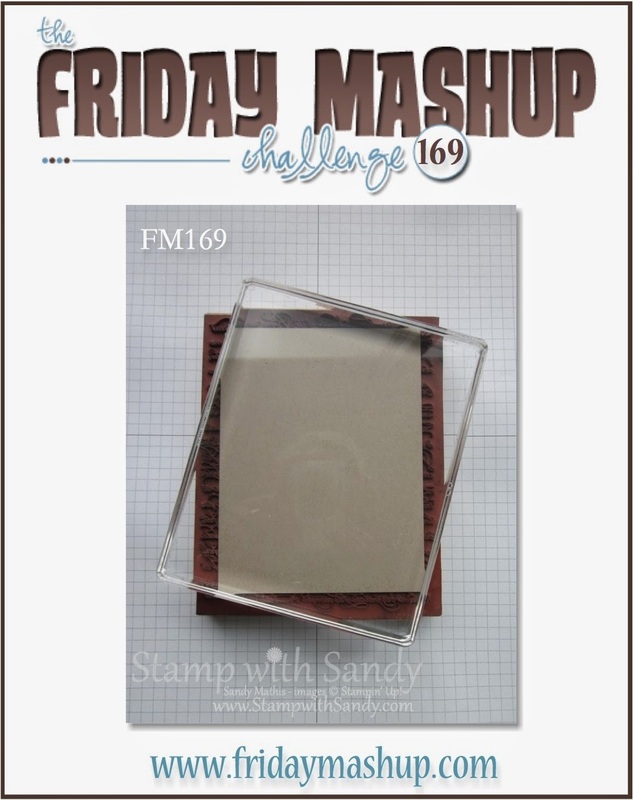 The Friday Mashup Challenge can be found HERE. Hi and welcome to this week's Sunday Christmas Card Challenge. 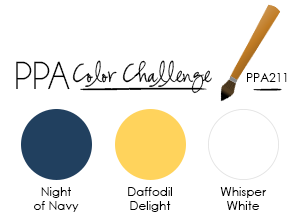 It's time for a color challenge as our option. 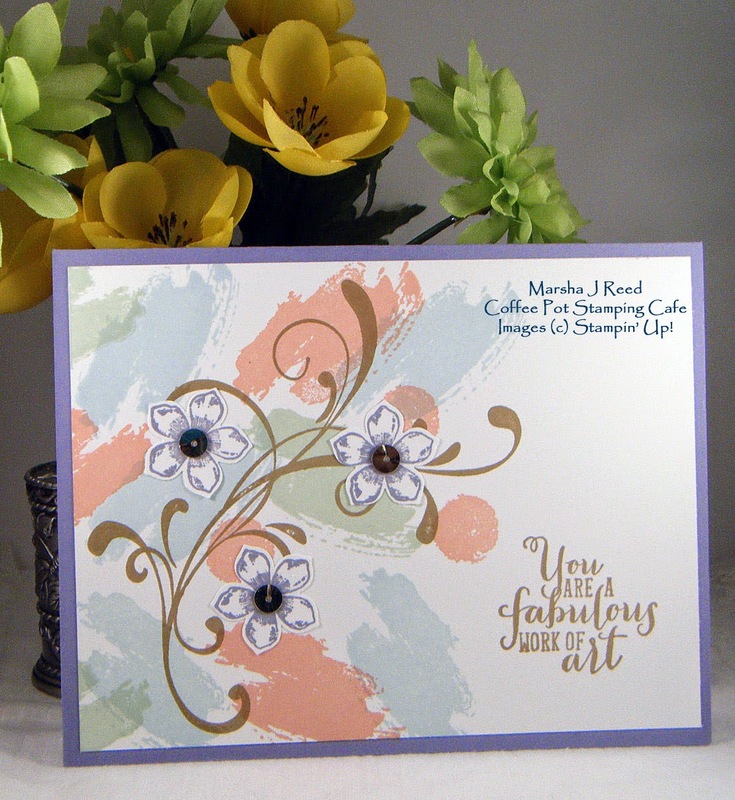 Just use the inspiration photo below and be sure to link your card to show us your design. We love to see your creations! The Sunday Christmas Card Challenge can be found HERE. 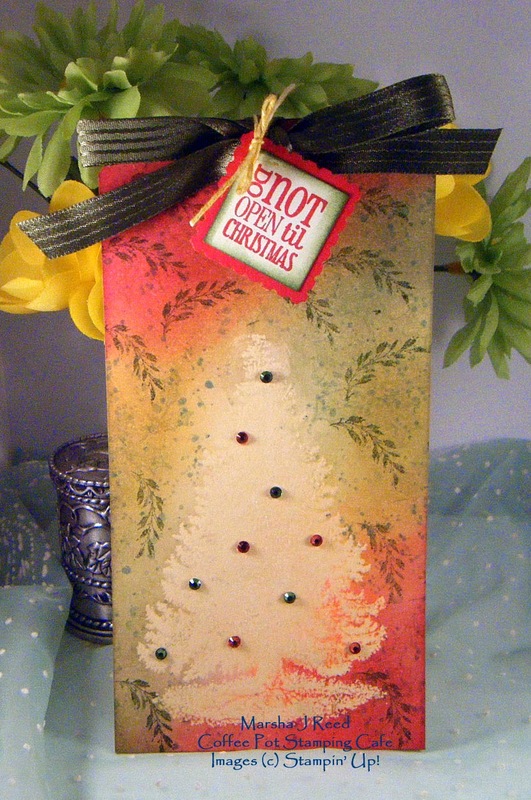 So, how are you doing with getting your Christmas card stash built up before it's time to send them out? Oh my gosh! 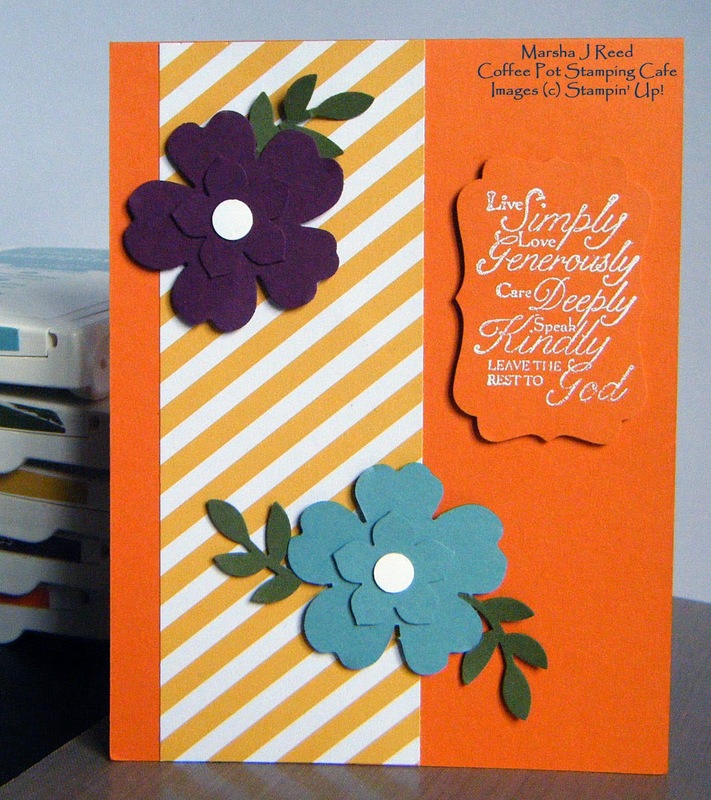 I love the Mojo Monday sketch this week and I love the Pals Paper Arts colors and that is what I a perfect match! The colors immediately had me thinking of my best friend, Sue, who lost her battle with cancer three years ago. She loved blues and yellows together. Again, pardon the shadowy photo. I need to get a replacement bulb for my lamp. Right now I'm working with only one. My major, once-a-month shopping spree happens next week so only a few more days to get through with shady photos. HERE is where you can find the Mojo Monday Card Sketch Challenge. Yesterday was my grandson, Dustin's, 14th birthday. 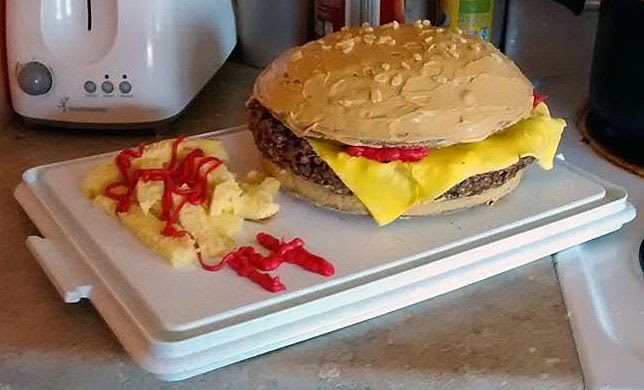 I was invited over to help celebrate with burgers on the grill and of course, cake. A few years ago, my daughter-in-law, Jody, started making cakes for the kids' birthdays. Each one gets more and more creative. She usually asks the birthday boy what kind of cake he wants, then she goes on a search and find mission to make it happen. This year, when asked, Dustin said, "I don't know." Now that's a very typical teen response to most questions! :-) So, Jody, surprised him with this cake. Oh my gosh! Dustin loved it! You should have seen his eyes light up when he realized it was a burger with fries! He said it out did the dog dish cake she made him last year. 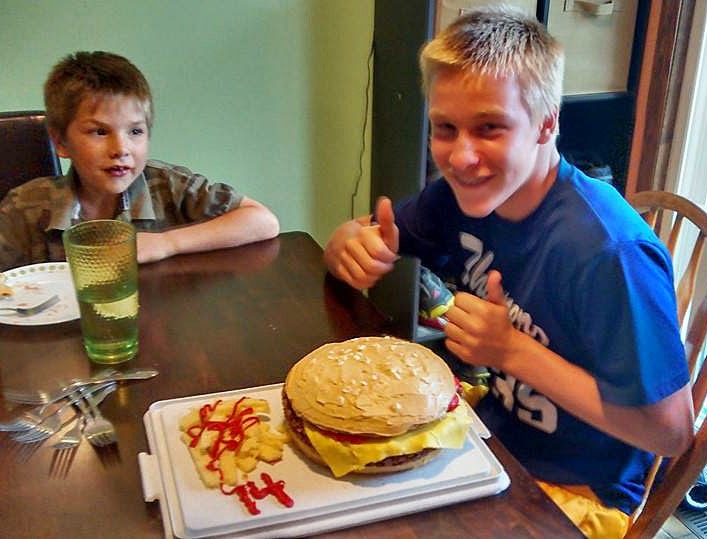 As you can see, this young man was very pleased with his cake. We had a great time together and we're all looking forward to the next birthday cake. Nicholas, who is on the left, has a birthday coming up in October. He has already put his order in and it will be fun to see what Jody does with that one. You can sure tell it is July in Iowa. The temperatures range in the mid to high 80s, with some 90s, and the humidity is suffocating. Fortunately, my nice cool craft studio let's me look out the window and enjoy the summer while keeping the heat away. I spent the afternoon making cards and planning some upcoming classes. Here's today's card using the sketch from CAS(E) this Sketch. It was just plain fun to try my hand at doing some water coloring. I don't do much of it but it does stretch me when it is offered up as a challenge. 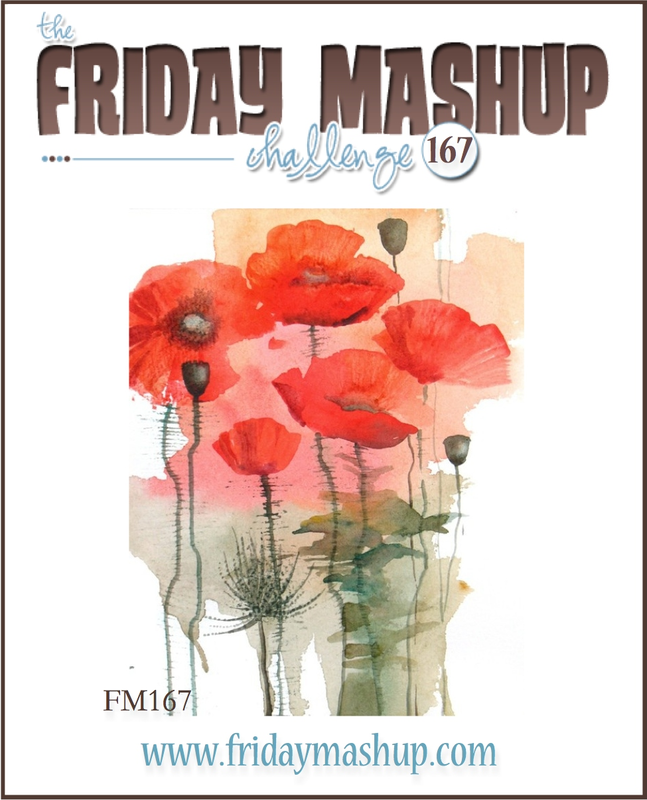 The Friday Mashup Challenge this week was to create a project with a watercolor wash, create a CAS or one with minimal layers or mash it up and use both. As always, I tried both. The watercolor wash background was done on watercolor paper. I used Dimensionals to pop up the background. Sometimes I have a hard time getting the water color paper to stay stuck, especially after it's been wet. 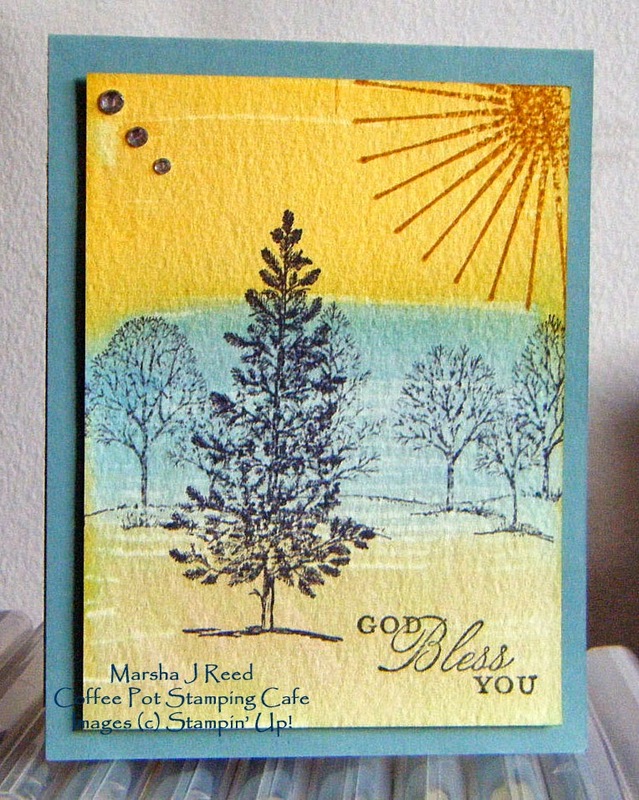 Of course, I had to use my all time favorite stamp set, Lovely As a Tree! It's time for another Watercooler Challenge. This time it's a sketch. I grabbed my Mossy Meadow and had fun mixing up some of my favorite stamp sets. I really love that 'you' from the Work of Art stamp set. As I turned on the lamps for my light tent, one of them burned out so my photo is a little on the dark side. Those things just seem to happen when you least expect. You can find the Watercooler Challenge HERE. Wow! This year is officially now half over. Now, if the next few months go as fast, the time to send out our Christmas cards will be on us before we know it. Good thing you've all been making cards each week, right? :-) If not, don't despair, there is still plenty of time to join our Sunday Christmas Card Challenge and get on track to have your cards done before December. A holiday or Christmas card is all you need to do to join in the challenge. But, you can also give the optional challenge a go, too. This week it's "Thinking Tags." 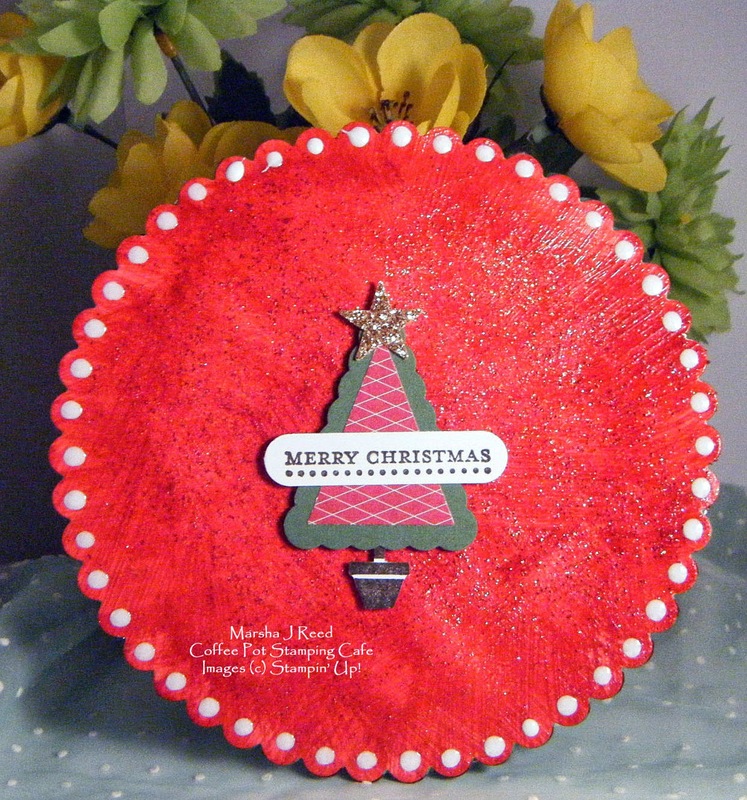 Just make a Christmas tag or incorporate a tag on your card. You can find all of the details for the challenge HERE. I hope everyone had a grand time celebrating our nation's birthday. I love July 4th! 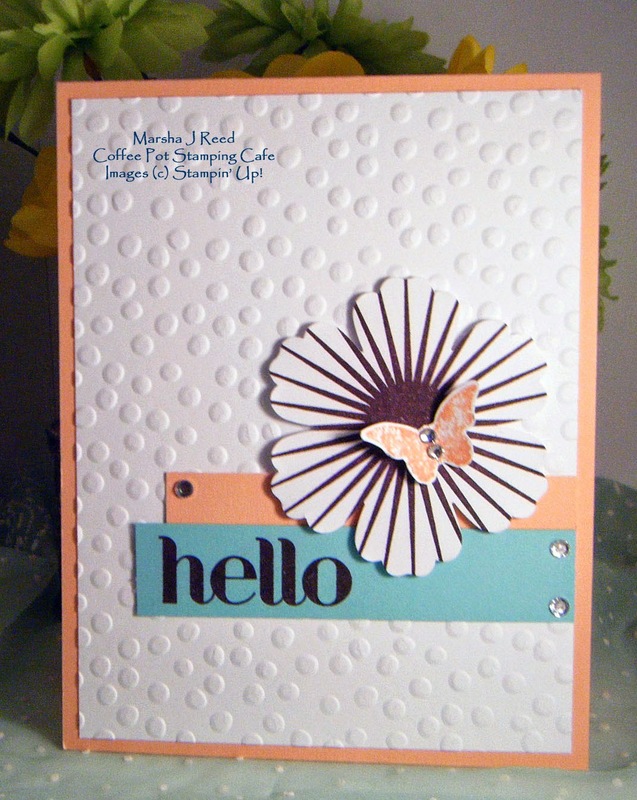 Just a quick post today to share the card I made for the Freshly Made Sketches Challenge and for The Paper Players Challenge. 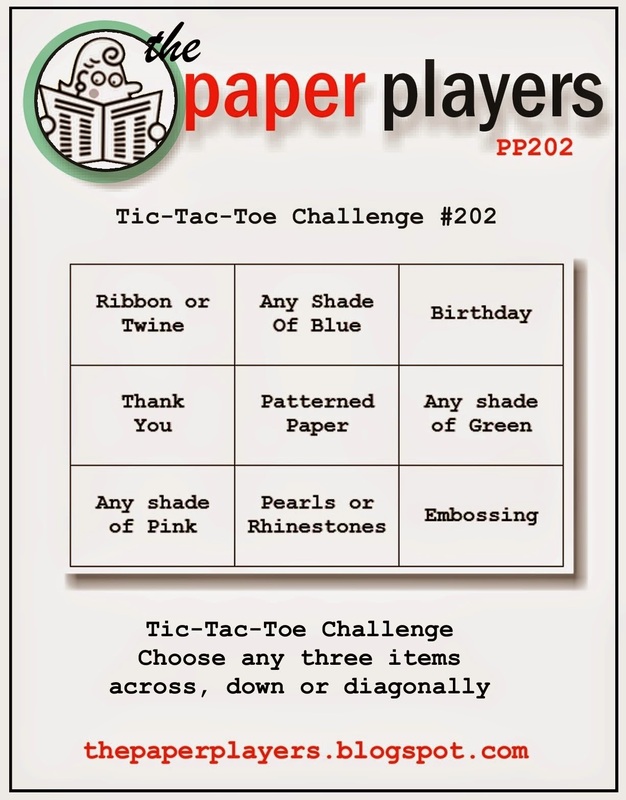 For my Tic-Tac-Toe, I chose the three center blocks which are any shade of blue, patterned paper and pearls or rhinestones. You can find Freshly Made Sketches HERE.